In our most of our simulation and inprovement projects, optimization is the key word. For this purpose we create heuristic algorithms and mathematical solvers to test and optimize all kinds of systems. Most of the times these solvers are used strategically to determine the best control rules. As the real world is very complex, the optimization algorithm should be able to cope with details and uncertainties. For this purpose we also use the power of simulation. Advanced Planning Scheduling (APS) algorithms and rules are tested and further optimized in the simulation environment before implementing. 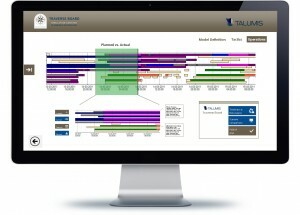 Also simulation models are even used to create plans and schedules: the result of a simulation is the plan or schedule for tomorrow. The combination of mathematics and heuristic rules together with an simulation environment can result in very powerful and proven schedulers. Mathematical optimization models can only cope with a fixed setting, which can render an optimized schedule obsolete the moment in reality a process is longer or shorter. As simulation can also cope with uncertainty, we are able to create more robust schedules that function much better in an dynamic environment. Click here if you want to know more about simulation and APS?